Combine brown sugar, sugar, cinnamon and salt. Add melted vegan margarine and stir well. Lastly, add the flour using a fork to combine. It should look all crumbly like this. Set aside while we prepare the rest of the cake. 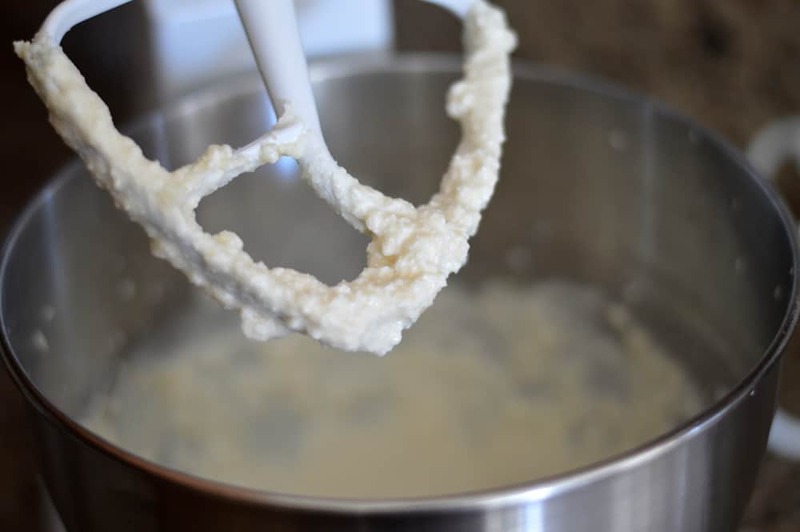 In the bowl of an electric mixer, add the softened vegan margarine and sugar. Beat until well combined. Add the vegan sour cream, applesauce and vanilla. It may look a little curdled, but I promise you. This situation is temporary! 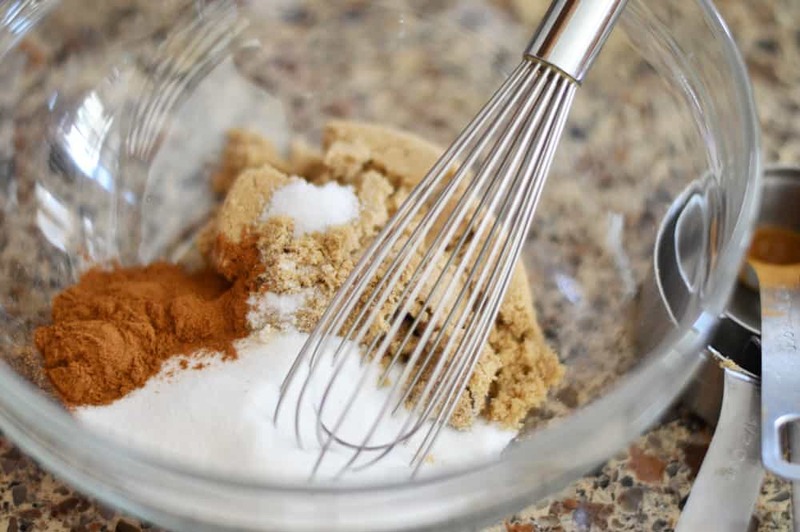 In a small bowl, whisk together the dry ingredients and add to the mixing bowl. 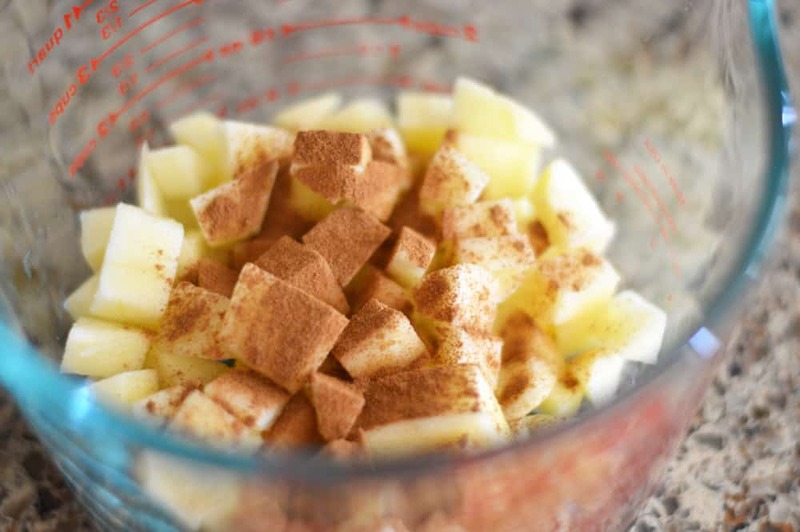 Add the diced apples and cinnamon to a small mixing bowl and toss until all of the apples are coated. 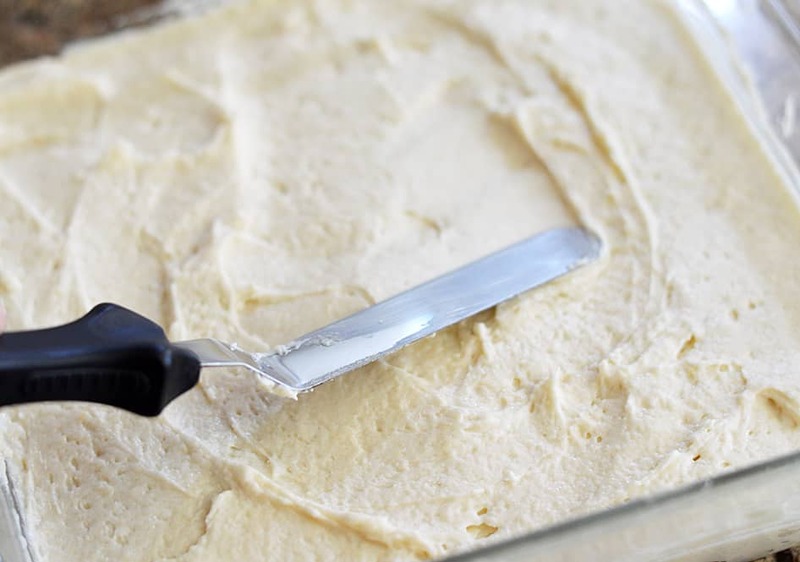 Place them on top of the uncooked cake batter and give them a light press into the batter. 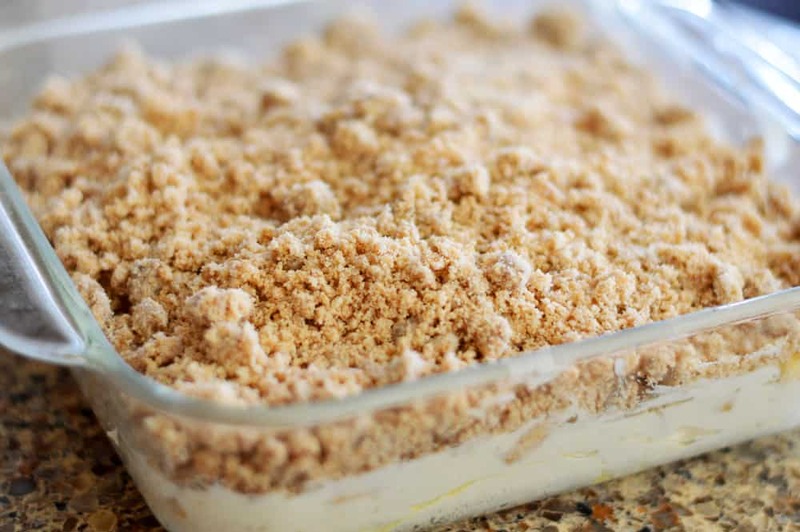 Now, take your reserved crumble topping and spread evenly over top. Give it a good press into the apple layer. Bake until golden. Cool for at least 20 minutes before adding the glaze. Just look at this. 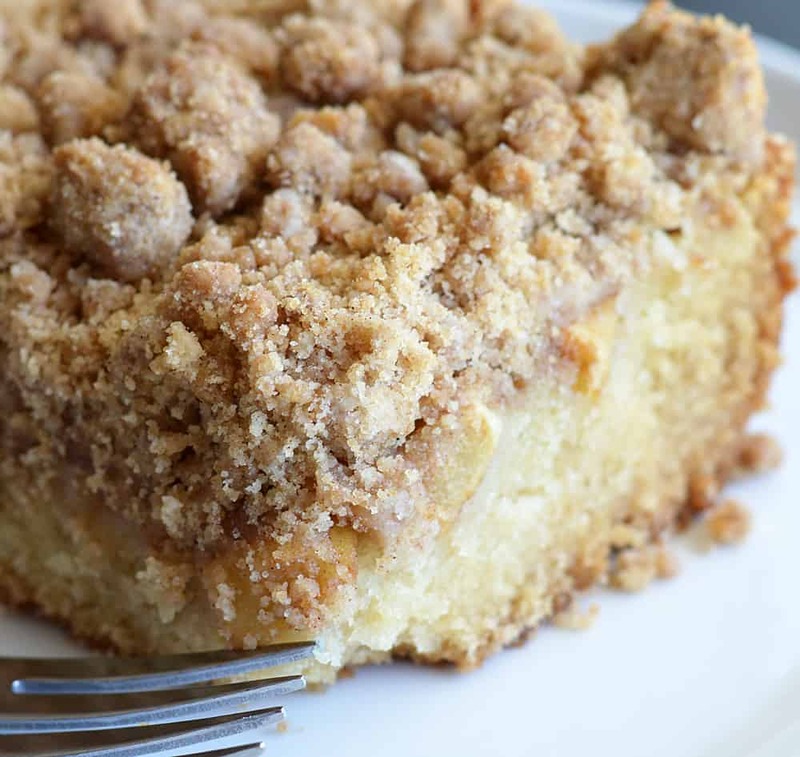 You have a cake layer, an apple cinnamon layer and finally the crumb topping. Three layers of goodness! But my mom requested a powdered sugar glaze and it was a good choice. 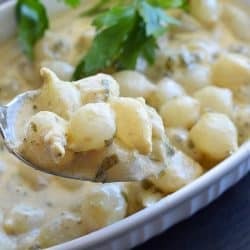 Really delicious and simple to make. 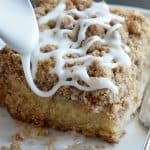 Did you make my Apple Crumb Cake with Powdered Sugar Glaze? Leave me a comment below and let me know what you thought. Prepare an 8" x 8" baking pan with cooking spray. Set aside. 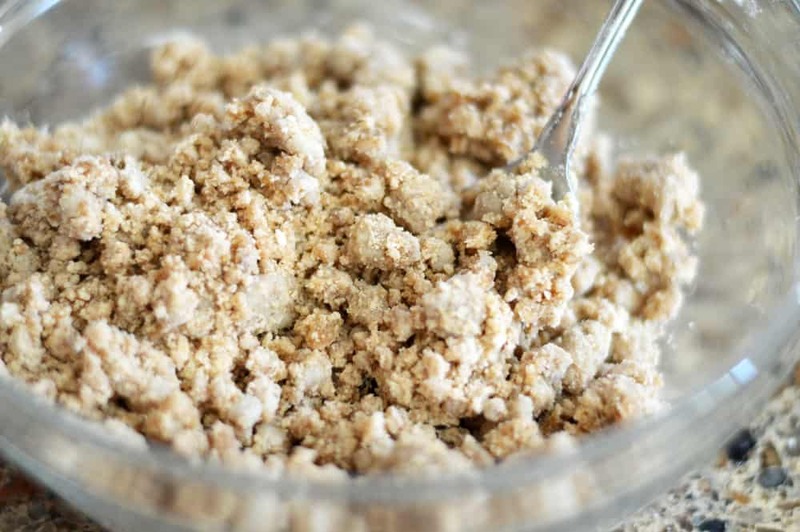 To make the crumb topping, whisk brown sugar, granulated sugar, cinnamon, and salt together. Add the melted butter using a fork to incorporate, then add the flour. 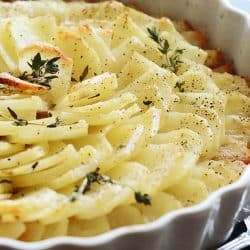 Mix and crumble with a fork. Set aside. 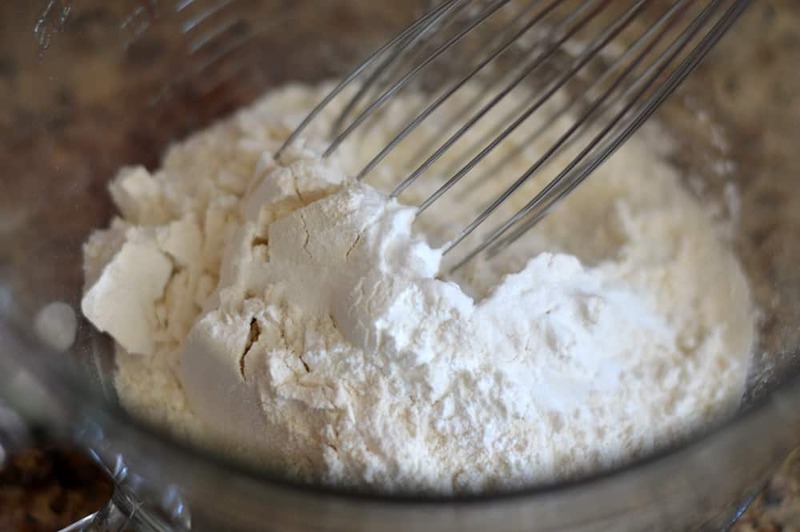 For the cake, whisk the flour, baking soda, baking powder, and salt together. Set aside. 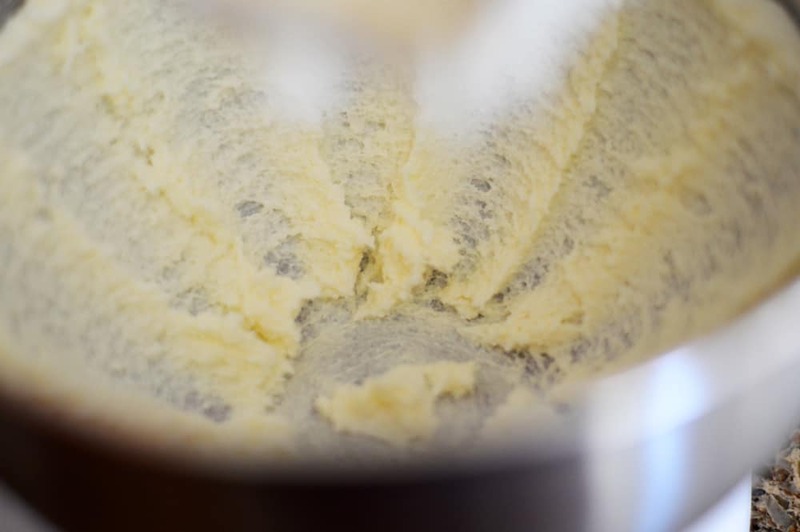 In the bowl of an electric mixer fitted with the paddle attachment, beat the butter and granulated sugar together on high speed. 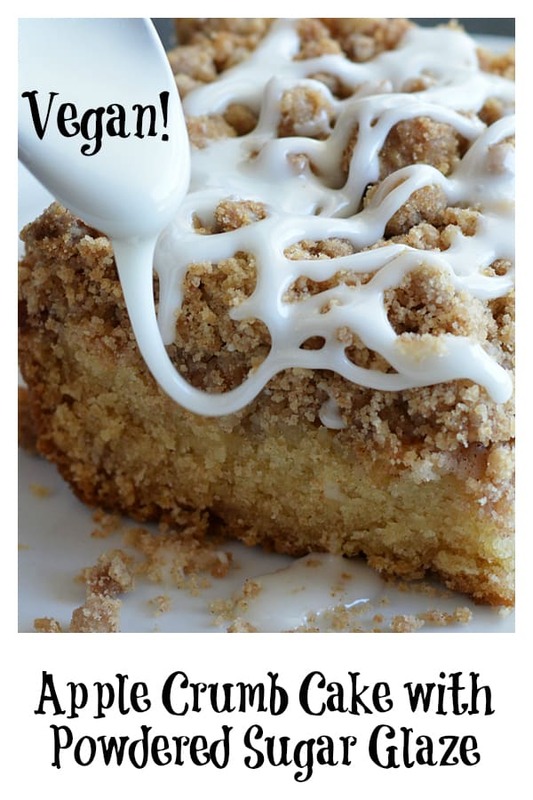 Add the applesauce, vegan sour cream, and vanilla. Beat on medium-high speed until combined. On low speed, just mix in the dry ingredients until incorporated. Do not over mix. Spread the batter evenly into prepared baking pan. 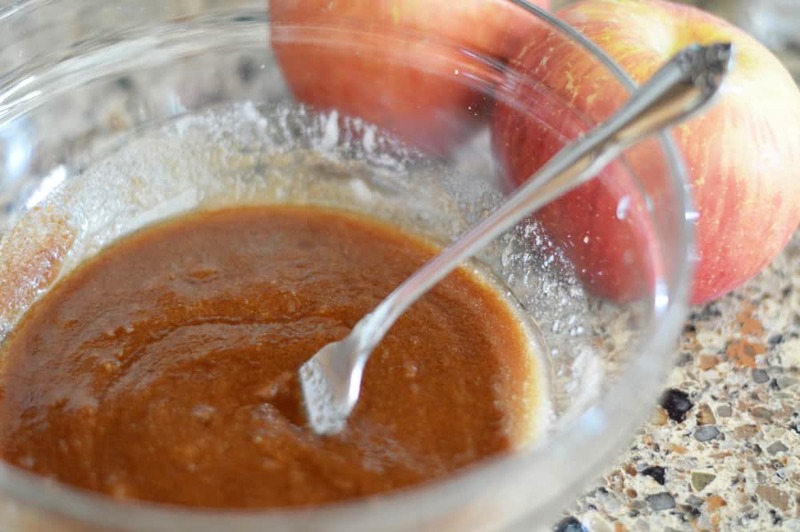 Toss the chopped apples and cinnamon together in a small bowl until well coated. 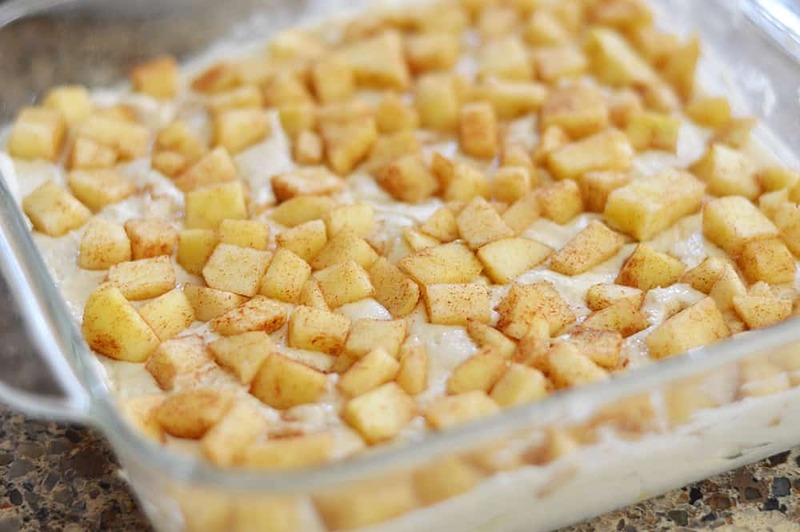 Top the batter layer evenly with cinnamon apples. Lightly press into the batter. 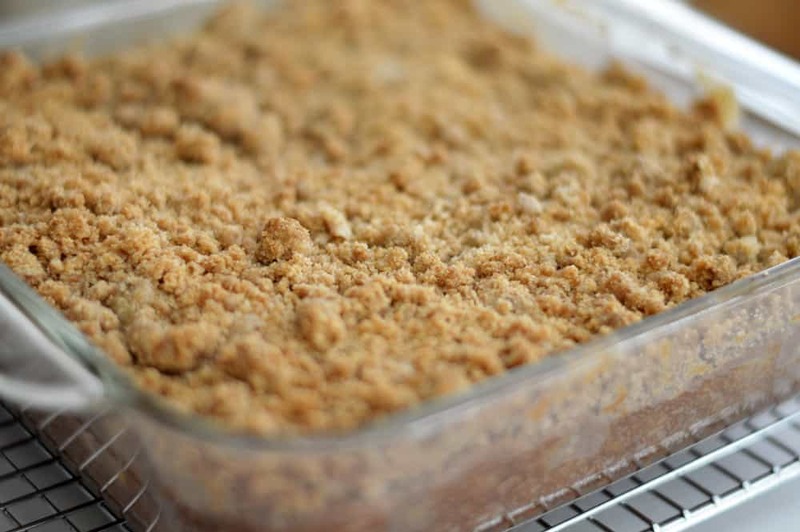 Top the apple layer evenly with crumb topping. Again, lightly press into the apple layer so that after baking, everything sticks. Bake for 45-55 minutes, or until a toothpick inserted in the center comes out clean. Every oven is different, so keep an eye on it. Cool at least 20 minutes (or more) before applying the glaze. 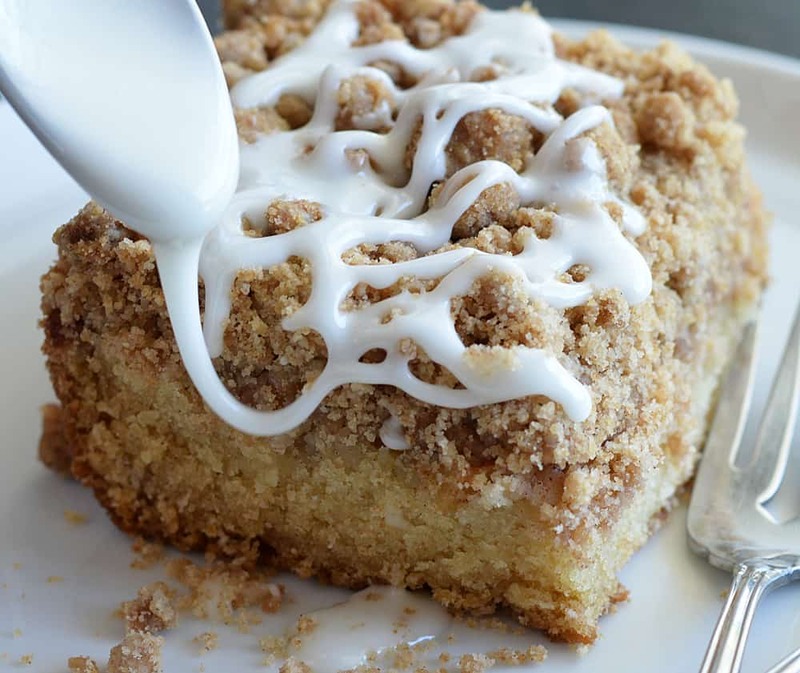 Whisk the powdered sugar and almond milk together until smooth. If it's too thick, add more almond milk. Too thin? Add more powdered sugar. If you can't find vegan sour cream, a thick vegan Greek Yogurt would be the substitute.